Danny Willett has become only the second Englishman ever to win the Masters after a shock victory at Augusta following defending champion Jordan Speith’s meltdown. Twenty-eight-year-old Willett, of Sheffield, recorded a bogey-free round of 67 to become the first Englishman since Nick Faldo in 1996 to put on the iconic Green Jacket. But his maiden Major victory came about after last year’s reigning champion Spieth, who was five shots clear at one stage, shocked the golfing world after picking up a quadruple bogey on the par-3 12th to plunge himself down the leaderboard and fire Willett up it. Willett, who has recently become a father for the first time, started the day on level-par but picked up birdies on the 6th, 8th, 13th, 14th and 16th holes to claim victory on five-under-par, three shots clear of Lee Westwood and Spieth on two-under. 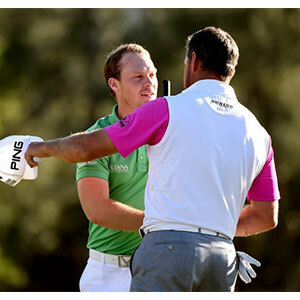 Speaking shortly after his round finished, Willett said: “It was a bit of a weird one. Luckily I was able to keep my head on and keep focused. Englishmen dominated the final leaderboard with Westwood finishing as joint runner-up, Paul Casey in fourth, and Matt Fitzpatrick and Justin Rose also in the top 10. Spieth’s round started off his round in title-winning form, best highlighted by four birdies in a row from the 6th to the 9th. The 22-year-old was five shots clear of Willett on the 10th tee. However, his day of glory quickly unraveled into a nightmare with two bogeys on the 10th and 11th before disaster struck on the par-3 12th. His tee shot hit the bank and rolled into the water. He horribly mishit his drop shot back into the water and then his third retake found the far bunker. He would eventually hole his putt for a quadruple bogey to go to one-under-par and three shots off Willett in a remarkable turnaround. Spieth’s errant shots off the tee over the course of the week had eventually come to bite him at such a pivotal moment. And what looked to be a straightforward back-to-back victory for Spieth suddenly turned into a four-horse race between Willett, Lee Westwood, Dustin Johnson and Spieth – with Willett out in front. Willett kept his composure to claim a shock Major win and become the first European victor since 1999 when Jose Maria Olazabal was crowned champion. The final round at Augusta was generally easier than the previous days, as it usually is on the last day, with the pin positions offering the players opportunities to claim a plenty of birdies. Casey and Fitzpatrick helped fly the flag for England, along with Spieth and Westwood, with exceptional rounds of 67, which was only bettered by Spieth’s 66 in the first round. Holes-in-one were the order of the day on the 16th hole as three players – Shane Lowry, Davis Love III and Louis Oosthuizen – all fired home remarkable tee shots. Oosthuizen’s effort is sure to be shown on replays for years to come after it knocked playing partner J.B. Holmes’ ball past the hole and then slowly trickled in for a sensational hole-in-one.